Cree CR6. The ultimate LED downlight. Philips. The ultimate Customer Service experience. 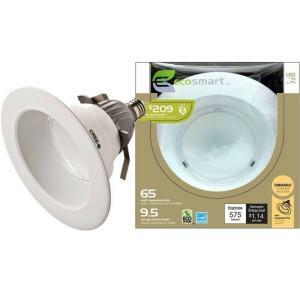 After the glass bulb dropped off 2 of our Philips Marathon R40 CFL downlights, I decided to put in Cree CR6s, also known as the ecosmart 575-L over at Home Depot. According to the HD packaging, 9.5 watts = 65 watts incandescent but Cree says that 10.5 watts are needed. These downlights have a 2 700K color temp with a CRI of 90 using Cree’s “true white” technology. They were on special at HD for $40 with a limit of 10 per trip too. Check for better online deals because I’ve heard that HD will price match. All I can say is wow. Perfect color temp, super clean appearance, quick install. They also dim perfectly with my US-1130 SAI switches. Getting back to the original failure that prompted this purchase, it turns out that Philips has a recall going with the Marathon Classics due to the glass shell separating from the base and falling off. They are refunding my purchase price, 14 lights in all and they really want to see them too (2 of the failed ones weren’t on the recall date stamp list, and a third, also not on the list, was about to fail), so I’m getting a check for $90 up front along with pre-paid packaging to send all 14 back. When they receive the lights, they will mail me the balance of my refund. No questions, no UPCs, no receipts. Now that’s customer service!